Greetings of greening to you all. I love this time of year. Lots of people visit the Catskills in the fall, for the autumn leaf show, but I think the beginning of the leafing is just as beautiful. You just have to look a lot closer. 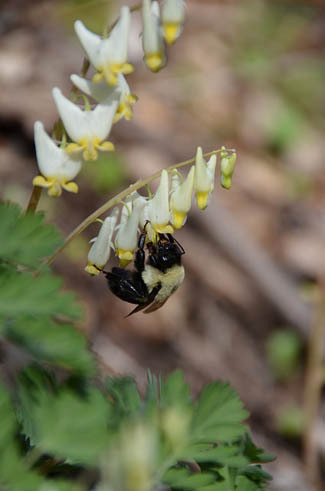 Look for the faint sweeps of colors across the hillsides as the trees bloom: blushes of red maple, sweeps of white willow catkins, tiny pine flowers dropping yellow pollen. 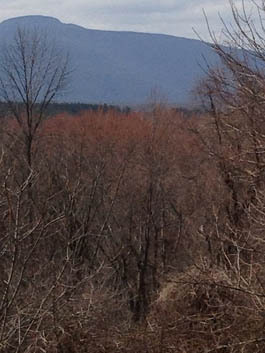 Then notice the first glimmers of green – lime green, grassy green, budding green, blue-green, vibrant green – as the leaves emerge from their protective winter sheaths. And while you are out looking, bend close to the forest floor. 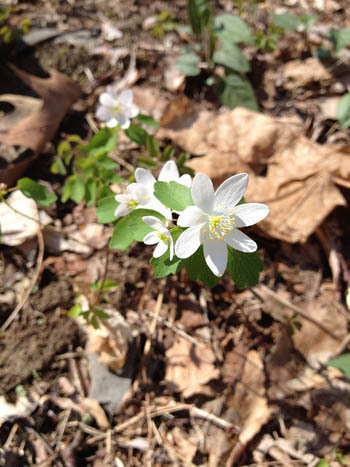 Just before the leaves bring shade, the native perennial plants grab the sun and bloom, bloom, bloom. Every walk in the woods this month offers us a fresh delight of wildflowers. I share some of my recent finds with you in our weed walk, following. And every day seems to bring new flowering bulbs into the sun. What rich colors! What fascinating shapes. I envision where I want to plant more this fall for more delight next spring. It is not too late to join my new Healthy Heart online class. Our first teleclass was yesterday (May 5), but we recorded it, so you can listen at your convenience. Join me as we explore the delicious foods and healing herbs that can give you a healthy heart, prevent strokes and heart attacks, and help you get off (or never take) hypertensive drugs, statins, and blood thinners. What a perfect arena for us to proclaim: Herbal medicine is people's medicine! 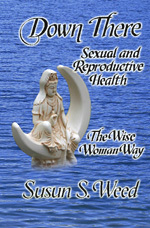 This new course – a Healthy Heart the Wise Woman Way – contains three units of four lessons each, for a total of twelve lessons. You are free to take one, two or all three units. Each unit includes four lessons, assignments to complete, twelve herbal monographs, recipes, special bonuses, three teleclasses, and access to an interactive forum with me and the other students. I expect it will take most people 8-10 weeks to finish each unit (four lessons); you are free to do the lessons as slowly or quickly as you desire. But for now, get up. Go outside. Take a walk in the woods. Visit a nature preserve. Spend some time in your garden or back yard. Go to a park. Take the dog for a walk. Right now. Get up and get outside and enjoy the green blessings that surround you. 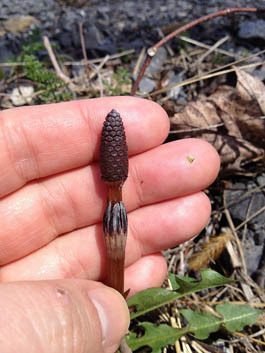 Horsetail is an ancient plant, more closely related to ferns and mushrooms than to flowering plants. 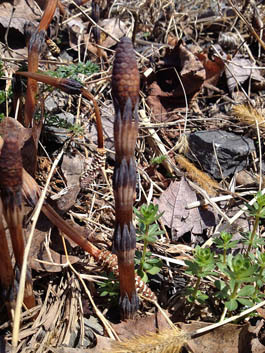 Like ferns and mushrooms, horsetail reproduces via fruiting bodies which release spores. This is a photo of one of those fruiting bodies. After releasing its spores, the fruiting body dries out and decomposes. The part of the horsetail used by herbalists is the "leafy" stalk, harvested early, usually no later than the beginning of June. Here they are en mass and up close. The beautiful flowers of the red maples. A favorite food of both the bees and the squirrels. 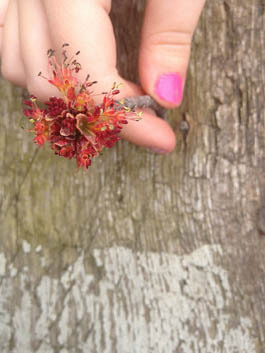 When red maple flowers litter the ground, then summer is here. They are edible, if a bit astringent; try a few in salads if you wish. 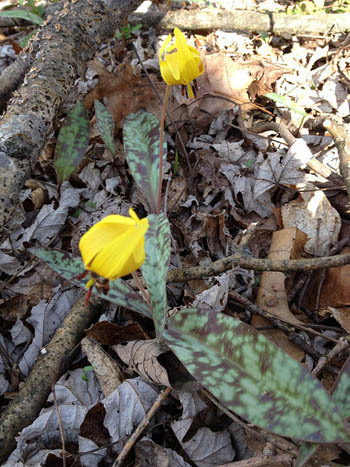 Here are some of common woodland flowers we found blooming this week. We snacked on a violet blossom or two as we walked, since they are not the reproductive flowers. But we left all the other flowers alone so they could set seeds and create more beauty for our walks in the future. Please do the same. Resist that temptation to bring some home. Little woodland flowers do best when left alone. 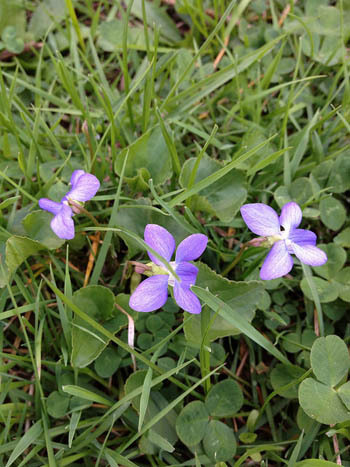 I was shocked to hear someone asking how she could rid her lawn of the violets that were growing there. 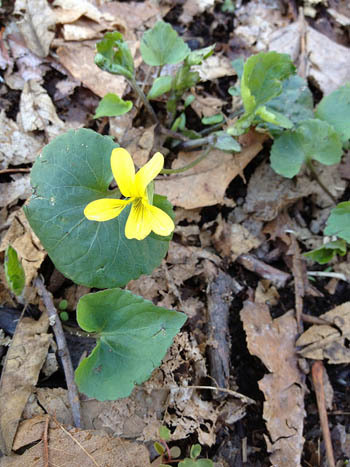 All violets are edible and medicinal. They are beautiful and they make us beautiful. Cherish your weedy violets. Don't mow the lawn until they bloom. Revel in their joy. Toss the flowers into your salad. Later, harvest leaves to make one of the most potent anti-cancer infusions known. 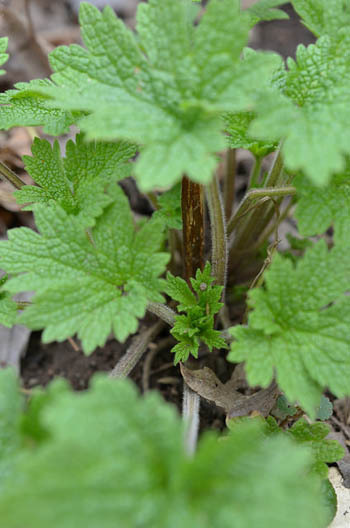 These tender young motherwort leaves are just the right size to use for motherwort vinegar. As a matter of fact, now is a great time to make my celebrated Triple Goddess Vinegar: equal parts maidenwort, motherwort, and cronewort leaves in pasteurized apple cider vinegar.